"The kami are already angry. It's not difficult to turn their rage to your advantage." Order your own copy of Tainted Lands at your local retailer or online through our website today! Direct, thorough, complete; the Earth is unmovable in its will. This persistence provides comfort to Rokugan. As the Earth’s will is immovable, so too is the great Kaiu Wall unbreakable. Like the great Earth, the wall will not falter. But the Crab Clan know this to be merely a comforting falsehood. The Shadowland forces are relentless, and it is the duty of every Crab to keep the wall impenetrable. As the task becomes more and more difficult, how long can the great Earth protect them, and Rokugan, before it cracks under the pressure? 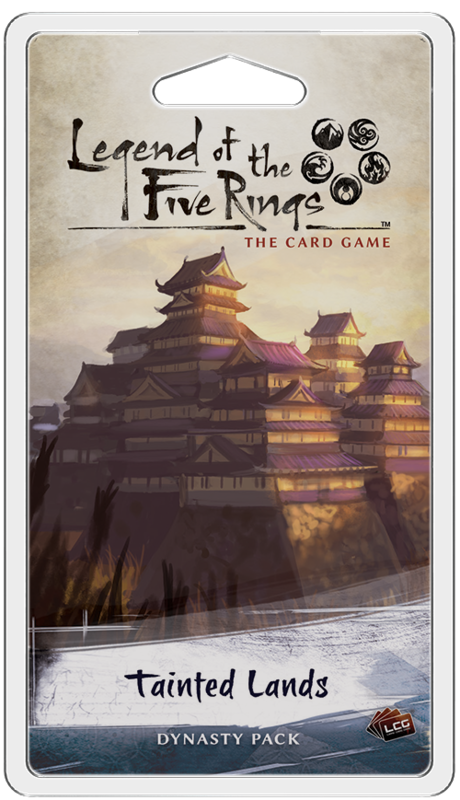 Join us today as we preview Tainted Lands, the second Dynasty Pack in the Elemental Cycle for Legend of the Five Rings: The Card Game! 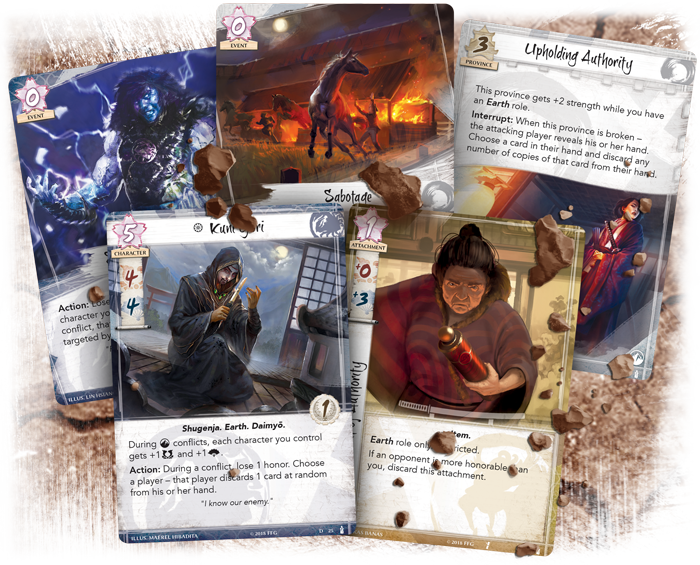 Tainted Lands continues the themes of the Elemental Cycle, introducing many different Earth based cards to the Great Clans of Rokugan, as well as a powerful new Shadowlands character who will aid you for a price. 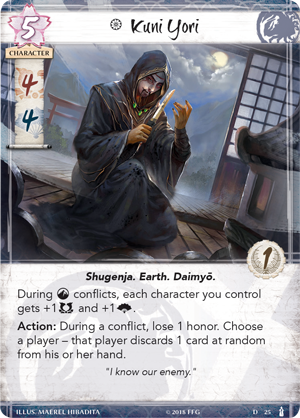 Look for Shugenja and Spells that expand upon the mystical side of Rokugan and the growing imbalance between the five elements. The Crab are willing to do whatever it takes to fulfill their duty to the Emperor and defend the land from threats on the outside. But how far is too far? And what price must be paid to protect the Emerald Empire from the monstrous creatures that slither and shamble toward the Kaiu Wall? Those who meet Kuni Yori (Tainted Lands, 25) never forget his piercing eyes, eerie voice, and sarcastic smile. As the Kuni family Daimyō, Kuni Yori believes in the mission of the Crab, and he believes that every resource must be put forward in battling the enemies to the south, that nothing should be wasted. An expert at studying Shadowlands creatures, Kuni Yori knows his enemy well and this knowledge serves him well in conflicts. With four military skill and four political skill, Kuni Yori is already formidable in any conflict. However, as a Daimyō, his presence can be inspiring, and during Earth conflicts, each character you control increases its military and political skill. It's also important to note that Kuni Yori doesn’t need to be participating in the conflict—he can simply be present in your home area. This is also true for his Action, which lets you lose one honor during a conflict to force an opponent to discard a random card from his or her hand. 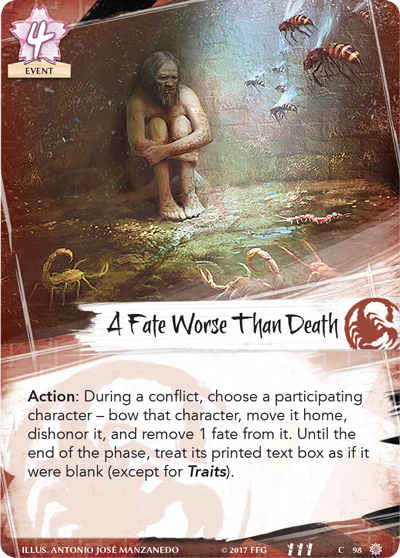 This ability, while dishonorable, synergizes well for Earth conflicts, which already see you discarding cards from your opponent’s hand if you win on the offensive. The more cards you discard, the fewer options your opponent has, and the more tempting a high bid during the draw phase becomes. Kuni Yori is a powerful Shugenja wielding mysterious magic, but he also wields the deeper power of knowledge and uses it to pick his foes apart. Of course, it takes more than just cunning warriors to hold back the horde of Shadowland monstrosities continuously marching on Rokugan. The Crab need every resource that they can muster, and as they become more desperate to defend their home, some fall to a corruptive influence. Blood magic is powerful in Rokugan: powerful, but dangerous. While many would never resort to the corruption of Mahō to defend their land, others embrace more extreme methods. 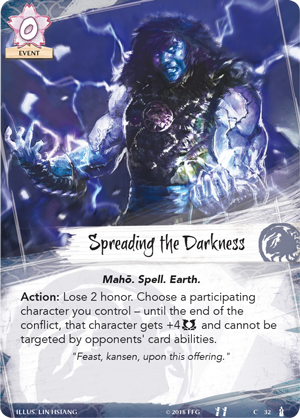 Spreading the Darkness (Tainted Lands, 32) is a zero-cost Earth Spell that has an additional cost of losing two honor. But its benefit can be game-changing, drastically increasing the military skill of one of your participating characters and making them impossible to target with your opponent’s card abilities. Both of these abilities are potent. An additional four military skill can easily swing a conflict in your favor, and with your character’s immunity, there is very little your opponent can do to stop them. Not even the tricks of the Scorpion can stop your character from spreading the darkness. The cost is just two honor. With two honor for unlimited power and the strength to win the game, the decision is easy. The monsters the Crab face are the center of nightmares in Rokugan. From manipulative Spirits to terrifying Oni, Rokugan would sleep easier knowing each of these enemies were slain on the battlefield by the mighty Crab. But the Great Clan has limited resources, and must sometimes do terrible things to defend the Emerald Empire, even if it means enlisting their greatest enemy. 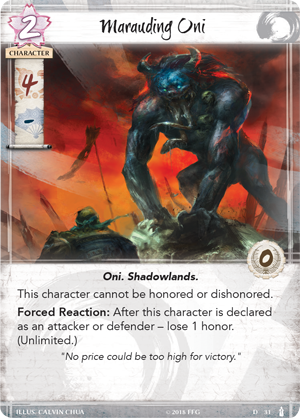 The Marauding Oni (Tainted Lands, 31) is a neutral Dynasty Character that has massive value. Costing two fate for four military skill, the Oni is a powerhouse. However, there is always a price to play for invoking the Shadowlands. After the Marauding Oni is declared as an attacker or defender, you lose one honor. This is a recurring cost for keeping the Oni around, but if you use the Marauding Oni in conjunction with Spreading the Darkness, you can very quickly find yourself with eight military skill for just two fate. That may just be enough to end a game, and what does honor matter in the face of victory? To the Phoenix, nothing can necessitate the use of Mahō, not even the threats to the south. They best know the power of the kami, and their understanding of the elements can be used to defend your provinces. Teachings of the Elements (Tainted Lands, 21) in an Earth Province that increases in strength as players claim the elements. For every claimed ring, Teachings of the Elements gains one province strength. 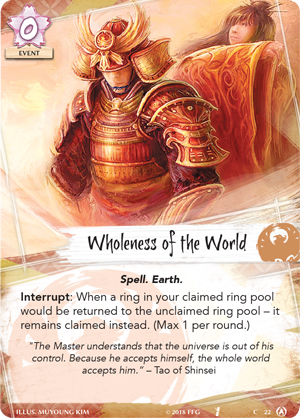 And what's more, with cards like Wholeness of the World (Disciples of the Void, 22), the Phoenix can give Teachings of the Elements a strength boost at the very start of their turn, making it a difficult province to get through. 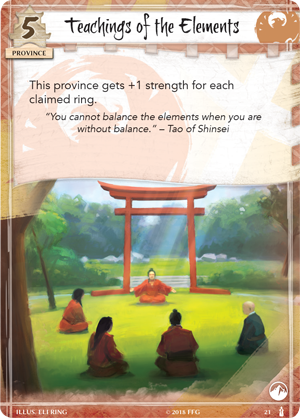 In order to break Teaching the Elements as easily as possible, your opponent will have to target it first, meaning that simply having this card on the field can thwart your opponent’s plan and have them focus on this powerful province. The longer a round goes on, the stronger the Phoenix defenses can become thanks to their understanding of the elements and their ability to remain grounded. The Shadowlands are marching towards Rokugan, and without support, the Crab may turn to extreme measures to protect the land of Rokugan. Earth is defensive and thorough, and the Crab harness this element to keep the Shadowlands at bay, but is it enough? The Phoenix would never fall to such depths, and they defend themselves through the knowledge of the elements.They know the elements protect, but they can also break. What will happen when the Earth becomes less tempered and unleashes its rage on Rokugan? Find out with Tainted Lands (L5C10), available now for pre-order from your local retailer or our website!